Purple Panthers hang around for awhile, but Raiders too much in end. Staff photo by Michael G. Seamans The Winslow High School football team celebrates its 35-0 win over Waterville on Saturday at Drummond Field. 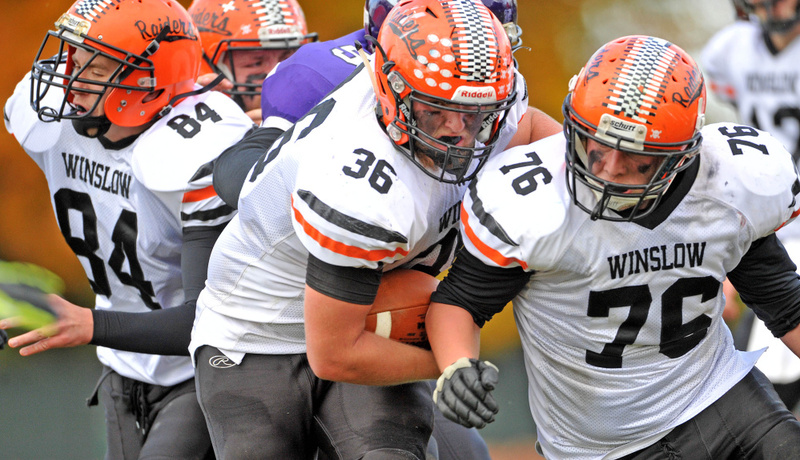 WATERVILLE — When the Winslow High School football team scored on its first drive, then forced Waterville three and out on the next possession, if felt like this year’s Battle of the Bridge would quickly become a blowout. 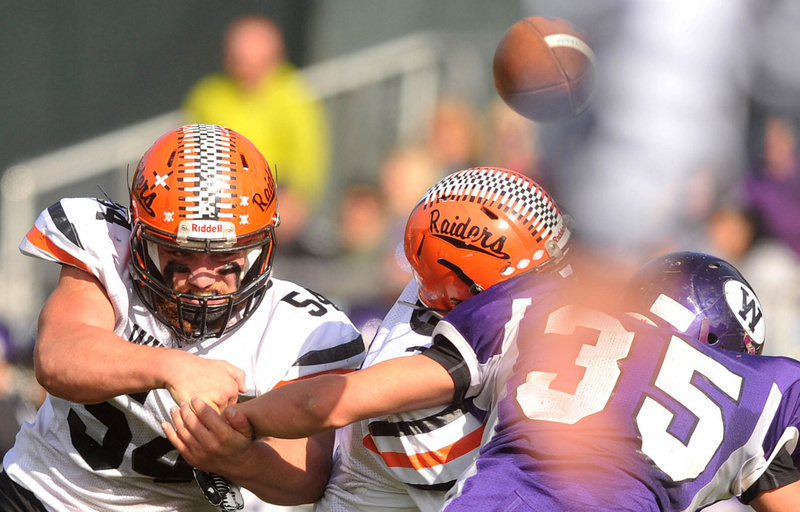 Waterville hung with the Black Raiders for a while, allowing just that early touchdown in the first half. In the second half, however, Winslow wore down the Purple Panthers and left Drummond Field with a 35-0 win. Immediately following the game, Winslow (8-0) lost a coin flip with Old Town (8-0) for the top seed in the Big Ten Conference playoffs. The defending Class C state champion Black Raiders will go into the playoffs as the No. 2 seed in the region. They still earned a bye to the semifinals. Waterville ends the season 2-6. 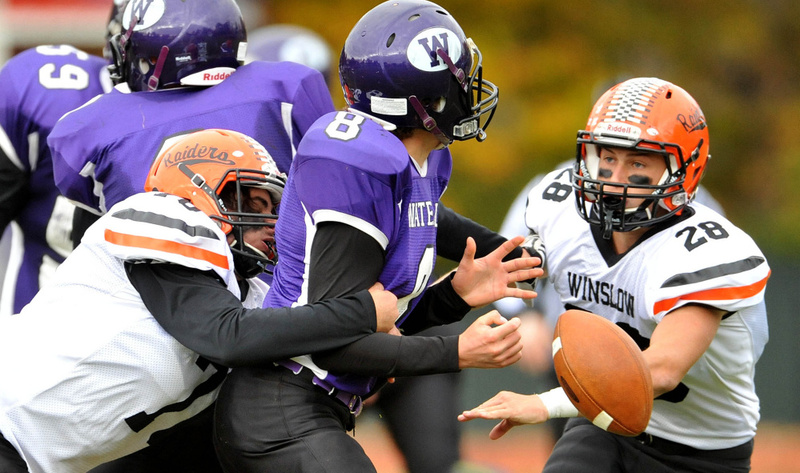 Waterville now leads the all-time series with Winslow, 51-33-4, although this was the fourth straight Battle of the Bridge win for Winslow, including playoff wins in 2014 and 2013. Winslow set a team record for points in a regular season with 406, breaking the mark of 384 set by the 2006 team. 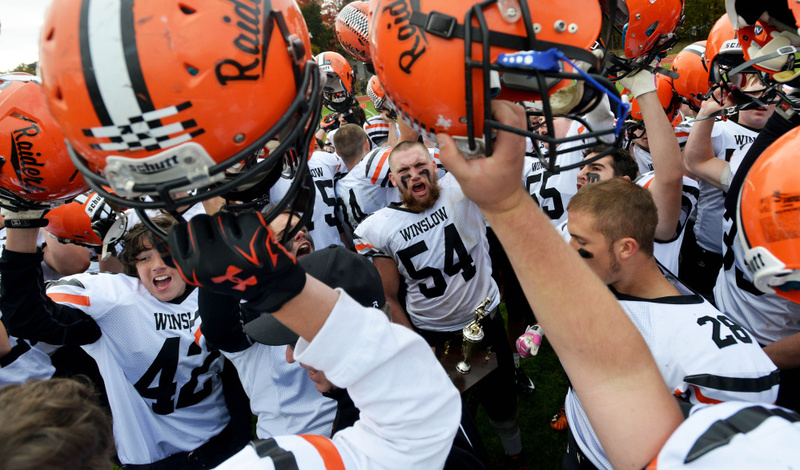 The Black Raiders also earned their fourth consecutive shutout and allowed just 27 points in the regular season. This game was the first all season in which Winslow’s starters played an entire game, coach Mike Siviski said. Down 6-0, Waterville got the ball to start the second half, but fumbled it away on the third play of the third quarter. Trenton Bouchard recovered for the Black Raiders, setting Winslow up at the Waterville 30. Seven plays later, Winslow quarterback Jake Trask ran in from 3 yards out. Ryan Gagnon connected with Dylan Hutchinson on the 2-point pass and Winslow had a 14-0 lead. “The turnover definitely got us going,” Trask said. The Black Raiders scored again with 3:02 left in the third quarter, again with the help of a Waterville turnover. 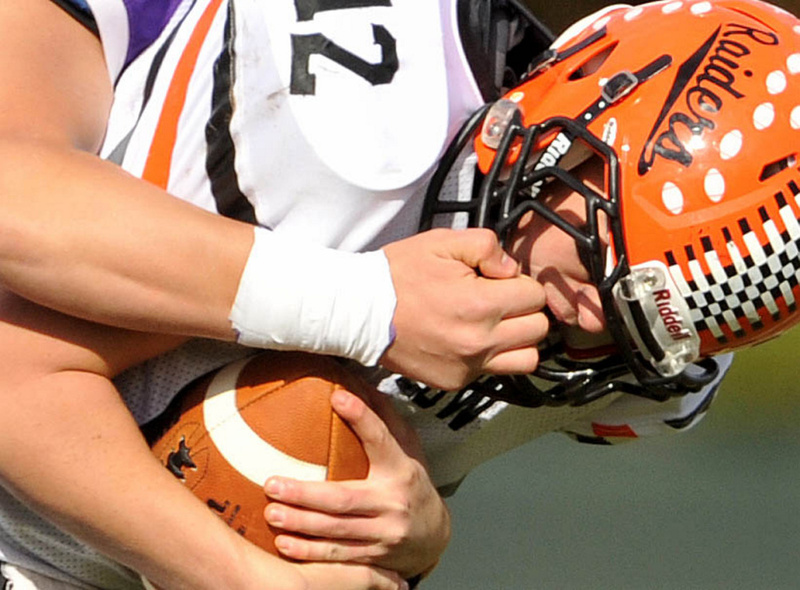 When Waterville muffed a punt, the Black Raiders gained the ball at the Panthers 21. Fullback Kenny Rickard capped the drive with a 1-yard touchdown run, giving Winslow a 21-0 lead. After a Bouchard interception at Winslow’s 14, the Black Raiders put together another scoring drive. This time, Nate St. Amand scored from 3 yards out to make it 28-0 with 6:46 to play. St. Amand scored again, this time on a 10-yard run, to cap the scoring with 3:19 left. In the first half, Waterville controlled the clock, slowing the game’s pace and running with some success. A key was moving offensive lineman Trever Gray to the backfield, where he worked as a strong lead blocker for Devon Begin (15 carries for 40 yards) and Demetrius Ramirez (11 carries for 33 yards). Trask scored on a 2-yard run with 9:15 left in the first quarter to give Winslow a 6-0 lead. The Black Raiders next drive ended when Gagnon missed a 30 yard field goal wide right, and Winslow had to punt its next two possessions, as Waterville’s defense came up big. “Waterville played a heck of a game, and confused us a little bit,” Trask said. The Black Raiders ran for 352 yards. St. Amand gained 164 yards on 21 carries. Rickard added 77 yards on 10 carries, while Trask gained 70 yards on 12 carries.